Canada's top civil servant shares some strong words with the justice committee. Michael Wernick, the Clerk of the Privy Council, says there was no unlawful or inappropriate pressure placed on Jody Wilson-Raybould. So are we any closer to understanding what actually happened? At Issue digs into the latest developments in the SNC-Lavalin controversy. Plus, a pro-pipeline convoy makes its way to Ottawa this week. Rosemary Barton hosts Chantal Hébert, Andrew Coyne and Shachi Kurl. The politics of byelections, cabinet shuffles...and secession. At Issue takes on Jody Wilson-Raybould's cabinet demotion and the latest in the Burnaby-South byelection. With the Liberal candidate forced out, does this give NDP leader Jagmeet Singh the break he needs? Plus, some of the lessons Canada can take away from Brexit. Rosemary Barton hosts Chantal Hébert, Andrew Coyne and Jason Markusoff. An upcoming cabinet shuffle and three byelection calls...The House isn't back yet, but the government is already making moves. The panel tackles some of these changes as we start the year. Rosemary Barton hosts Andrew Coyne, Shachi Kurl and Andray Domise. We start the year with what's on your mind. The At Issue panel answers your questions about 2019 and the upcoming federal election. Rosemary Barton hosts Chantal Hébert, Andrew Coyne, Paul Wells and Althia Raj. We look back on the political year that was. Who was the M.V.P. MP? Or the biggest political liability? The At Issue gang answers those questions and more. Rosemary Barton hosts Chantal Hébert, Andrew Coyne, Paul Wells and Althia Raj. The federal government announces $1.6 billion to help Alberta's energy sector. But the political and economic concerns are still there. At Issue looks into Ottawa's response and tensions around Canadian unity. Plus, the panellists take on the latest in the Canada-China dispute. Rosemary Barton hosts Andrew Coyne, Paul Wells and Shachi Kurl. Canada is caught in the middle between two superpowers. Ottawa says this isn't political, but China seems to feel differently. So is Canada being used? At Issue digs into the complicated Canada-China relationship. Plus, Alberta premier Rachel Notley's latest pitch for the oilsands. Rosemary Barton hosts Chantal Hébert, Andrew Coyne and Althia Raj. It's gearing up to be a tense first ministers meeting in Montreal. Some premiers are frustrated with the agenda and what they say is missing from it. At Issue sets up what's at stake. Plus, the panel looks into how far the Conservatives are willing to go when it comes to the immigration file. Rosemary Barton hosts Chantal Hébert, Andrew Coyne and Chris Hall. General Motors announces the closure of its plant in Oshawa, Ont. Meanwhile, Alberta's oil sector continues to suffer. So how should governments respond? And at what political price? At Issue digs into that. Plus, more fallout after Doug Ford backtracks on some of the cuts to francophone services in Ontario. Rosemary Barton hosts Chantal Hébert, Andrew Coyne and Jason Markusoff. The federal government unveiled its fall fiscal update this week. Now it's out trying to convince Canadians that going deeper into the red will benefit the economy. So do deficits even matter? The At Issue panel weighs in. Plus, they discuss the Ford government's cuts to francophone services in Ontario. World leaders are warning about the rise of nationalism. But what are the consequences of their messages? At Issue takes on a word that is getting a lot of attention these days. Plus, the prime minister brings his trade agenda to China and ASEAN countries. Andrew Scheer kicks Tony Clement out of the Conservative caucus this week. The panel digs into how political parties should handle this type of situation. Also, the U.S. midterms may be over, but what does a divided Congress mean for the Canada-U.S. relationship. Plus, the panel tackles Donald Trump's latest attack on the media. Rosemary Barton hosts Andrew Coyne, Althia Raj, and Paul Wells. 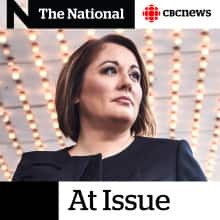 This week on the At Issue podcast, panellists Andrew Coyne, Chantal Hébert and Chris Hall join host Rosemary Barton to discuss the Liberal government's new Debates Commission, former Governor General Adrienne Clarkson's expenses under scrutiny, and the by-elections Prime Minister Trudeau has yet to call. The federal government revealed its plan to impose its own carbon tax on the provinces who refused one. And the critics have already come out swinging. Could this be the next big election issue? The At Issue gang talks everything carbon tax. Plus, the NDP loses another MP this week. Rosemary Barton hosts Chantal Hébert, Andrew Coyne, and Paul Wells.